Just as Neil Young walked onstage, a meteor streaked across the sky above the stage. "Played in an 11-hour concert today for over 9000 people… Pictures/met with Sarah McLachlan, Neil Young, Sheryl Crow… Never forget 09/12/09." 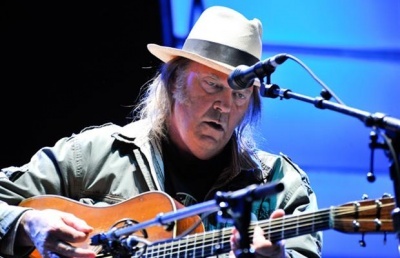 Neil Young acoustic set at Ambleside in WV on Saturday highlighted by Powderfinger and Pocahontas. The eastbound CN Rail train added charm. Neil Young just finished, absolutely epic. Very cool to see a legend like him play live. Sarah McLachlan will be on soon. 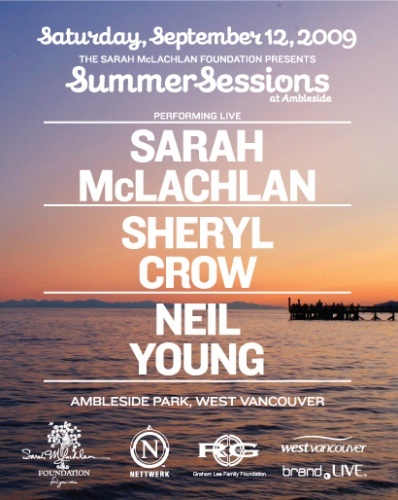 Neil Young will be performing today at the Sarah McLachlan Foundation concert with McLachlan and Sheryl Crow at Ambleside Park in West Vancouver, Canada. At first, I might want to Hold Back The Tears...but by the end am I gonna be Too Far Gone? Here's a link to the Vancouver Suns live blog of tonight's concert. Actually there are two clips, great! Thanks Homesick in Paradise! listening to Rust Radio right now, a show from 2004, Neil and the Horse in Albuquerque. No disrespect to neil's current touring band, but I yearn for the days of the Horse! It was a great show and a very nice way to celebrate my birthday -- a trip to Canada, party with rusties, unusual set from Neil... set list from Rust was submitted by me from the venue and is accurate. There is also the clip "Hold back the tears"
Thanks Homesick in Paradise, HarryO & Liza! The extra verse is on the Chrome Dreams version of the song. It's obviously referring to the use of prostitutes, but Neil's champions here will argue against that interpretation, as it doesn't suit their image of Neil. THAT is a hearty rendition of Hold Back the Tears! As good as I've seen of Neil. Could've been 30 years ago. Must be he's remastering his own live performances! Nice meteor video, but it wasn't filmed in West Vancouver. The only place I know of that has those sideways traffic lights is Alberta (and I doubt you could hear Neil from there - at least not an acoustic set).